04 - Natural Selection 04-11 - Divergence of Character 190 But we may go further than this. 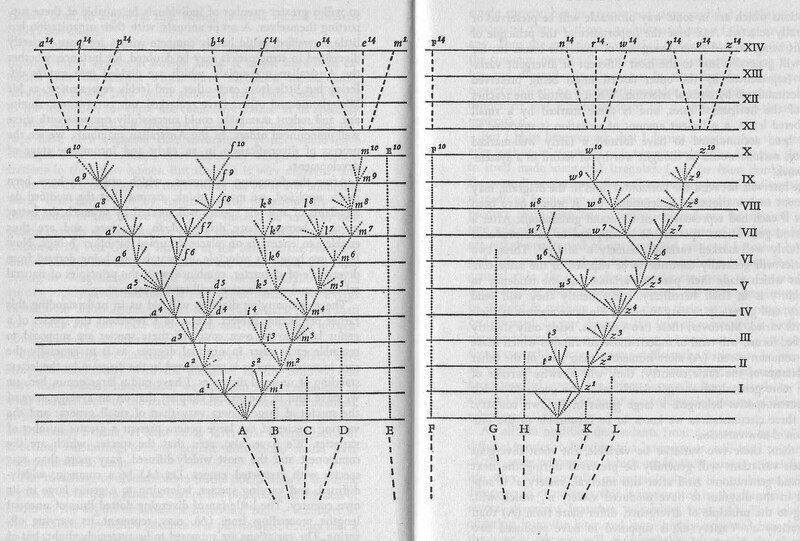 The original species of our genus were supposed to resemble each other in unequal degrees, as is so generally the case in nature; species (A) being more nearly related to B, C, and D, than to the other species; and species (I) more to G, H, K, L, than to the others. These two species (A) and (I) were also supposed to be very common and widely diffused species, so that they must originally have had some advantage over most of the other species of the genus. Their modified descendants, fourteen in number at the fourteen-thousandth generation will probably have inherited some of the same advantages: they have also been modified and improved in a diversified manner at each stage of descent, so as to have become adapted to many related places in the natural economy of their country. It seems, therefore, extremely probable that they will have taken the places of, and thus exterminated not only their parents (A) and (I), but likewise some of the original species which were most nearly related to their parents. Hence very few of the original species will have transmitted offspring to the fourteen-thousandth generation. We may suppose that only one, (F), of the two species (E and F) which were least closely related to the other nine original species, has transmitted descendants to this late stage of descent.